WHAT IS SEO / HOW DOES IT WORK? 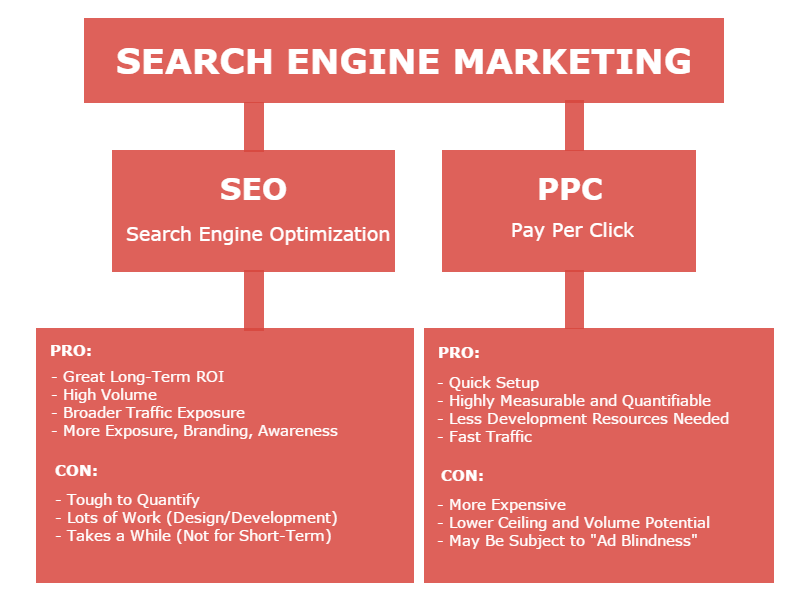 SEO (Search Engine Optimization) is a marketing strategy that involves techniques and tactics to increase traffic to a website by placing it on the first page of a search engine such as; Google, Yahoo, and Bing. SEO mainly focuses on growing visibility in organic (non-paid) search engine results. Being easily found greatly improves traffic, increases brand awareness, and increases revenue. Below is a video that explains exactly what it is and how it works for you visual peeps! It probably explains it better than I did. SEO is important because it helps improve rankings so that your content is placed where searchers will more easily find it. Placing your website on the first page of Google has proven that search engine traffic can make (or break) an organization’s success. In addition to better rankings, SEO helps the search engine understand what each page is about and how it may be useful to the users. Search engine robots crawl each website by reading its code, within the code are specific descriptions that allow the robots to put your site in a category that best suits your website’s description. Even though search engines are very smart they still need help, they are not human therefore they cannot see websites the way we do. SEO allows your website to be easy to understand for both users and search engine robots. In other words, without SEO your website can be invisible to the search engines. SEO works very much like the stock market. In the stock market, you choose your stocks with the knowledge of the market you have and wait. The stocks may go up or down but one thing you are certain of is that stocks are a long-term investment. Just like the stock market, with SEO you choose your keywords, you start to rank, your ranking may go up or down but just like stocks, SEO is a long-term investment. There’s no quick riches in both cases, however, in the long-term, you can expect to see major growth. One thing we do know is that a successful SEO campaign has great value! For instance achieving the #1 position for a keyword that’s searched 3,000 times will give you 40% of the clicks. Meaning you can expect to receive about 1,200 unique visitors to your site looking to purchase your products or services. There’s no standard formula to determine ROI with SEO but with proper keyword analysis, competition analysis, and analysis on the potential for conversions, SEO is worthy of investment. If you make the proper investment, and plan on being in it for the long haul, SEO is a marketing tactic with one of the best ROIs out there. It depends. Every single website, industry, and keyword competition are different, making it hard to give an exact time frame. There are many other SEO factors to take in consideration like the website’s age, how much SEO has been done on it, if any, what the website looks like, the website’s content, etc. However, generally it takes between 6 to 9 months for SEO to start working. In many cases businesses see results in as little as 3 or 4 months but bear in mind this is when you start to see results, SEO results grow over time. Whatever results you get at 6 months are far less than what you’ll be getting at 12 months. SEO pricing depends on many factors. Asking what SEO costs is a lot like going to a dealership and asking ” So, how much for a new car?” The natural response would be “Well, depends. What are you looking for?” Then the car dealer would proceed to ask a series of question to help him find the right car for you. If you need a Ferrari you’re going to pay a different price than if you needed a Honda. SEO works the same way, every business has different marketing needs and therefore tailored pricing is necessary. The more competitive and larger your target market is, the more expensive SEO will be, with some exceptions. Another thing to take in consideration is what size firm would you like to work with. Large firms (10-100 employees) tend to have a one-size-fits-all service, this can be good for businesses with limited budgets and limited SEO needs. Small firms (5-50 employees) tend to offer high-end customized services, if you have an ongoing SEO project for your marketing strategy and value hands-on, personalized service, then a small firm might be the fit for you. What’s Better, SEO or PPC? It depends on your business needs and budget. If you have a high budget and want fast traffic then PPC might be right for your business. If you want a long term investment with high ROI, broader traffic exposure and don’t want to pay for each click you get then SEO might be right for your business. Below is an image of several pros and cons for each marketing method.